A town of roughly 7,000 residents, Lexington is home to Washington and Lee University and the Virginia Military Institute. 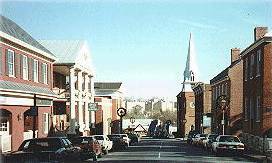 There are more than 100 culturally and historically significant sites in the Rockbridge County area, and the historic core of the City of Lexington is a Nationally Registered Historic District, as are the Washington and Lee Colonnade and the Virginia Military Institute Post. Lexington and the surrounding area has been the filming location for at least six movies, including, most recently, scenes for Steven Spielberg's War of the Worlds.Washington and Lee law students attend a variety of events on and off campus. From flag football to casual and formal events sponsored by the Student Bar Association and other student organizations, students find opportunities to relax and to enjoy their time in Lexington.Our unique location is one of the many reasons for our collegial atmosphere. At W&L Law, you get to know your fellow classmates as friends; these friendships preclude the cutthroat competitive culture so often associated with law school. Plus, where else can you find a foam rendering of Stonehenge, America's only community owned drive-in movie theater, a 38,000 slab of pink granite dedicated to Lexington-born statesman, politician and soldier, Sam Houston, a Dairy Queen once frequented by Tom Cruise and the best hamburger in Virginia? Admittedly, this is a hard thing to do. However, as someone once said, "If you think you can't, you're right, and if you think you can, you're halfway there." Downtown Lexington is a Nationally Historically Registered Landmark, and visitors can take walking and carriage tours highlighting the many points of historical interest in the downtown area. For the shoppers in our midst, Lexington is home to a number of great boutiques. There are also art galleries, bookstores, restaurants, an ice cream parlor featuring a tremendous selection of homemade flavors (we recommend the Mocha Chip and the Oreo), a couple of really good bakeries (the lunch rush at the Blue Sky Bakery may very well make you forget that you are in a small town) and local coffee shops in the downtown area. The first Friday of each month is the Lexington Gallery Walk, an opportunity to meet local artists as downtown galleries stay open late and show off their wares.Lexington Coffee offers bluegrass performances as part of its weekly "drop in" in the back room. Musicians are encouraged to "come in, grab a cup of something and listen to the live sound of banjo, mandolin, guitar, stand up bass, harmonica or who ever happens to show up this week." There are farmers markets held on Wednesdays and Saturdays throughout the warmer months (there's also a farmer's market of some note in Staunton for those visitors willing to make a short drive). And for grocery-shopping gastronomes, there is also the Cheese shop in Stuarts Draft (about thirty minutes from Lexington) that offers, yes, cheese, but also dried fruits, nuts, spices and a host of other bulk foods on a deep discount.And after you're through boutiquing, visitors should perhaps consider antiquing (a worthwhile pursuit for anyone trying to design a law school apartment on a dime). There are a number of antique malls throughout Lexington and the surrounding area, and while we can't guarantee what you will find, we also can't guarantee what you won't find. Or something like that. 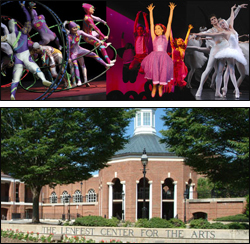 For the art, music and theater fan, there are a number of cultural offerings in Lexington and the surrounding area.On the Washington and Lee campus, the Lenfest Center regularly features theatrical, dance and musical performances by W&L students as well as professional performers including the Russian National Ballet.With respect to art, the University possesses several major art collections, including the Washington-Custis-Lee portraits, the Vincent L. Bradford collection of 19th-century American paintings, the Thomas F. Torrey II collection of landscape paintings, the Stan Kamen collection of Western art, the Sydney and Frances Lewis collection of 20th-century art (many of which can be viewed throughout the law school) and the Jacob and Bernice Weinstein collection of modern art. In 1967, the University received 4,000 ceramic objects from Mr. and Mrs. Euchlin D. Reeves, including an important collection of 17th-, 18th-, and 19th-century Chinese export porcelain. This collection and the paintings of Mrs. Reeves are housed in the Reeves Center, a research and exhibition center on campus.Recent additions to the art collections of the University include Chinese, Japanese and Korean ceramics, bronzes and jades on exhibit in the Watson Pavilion for Asian Arts, which opened in 1993. 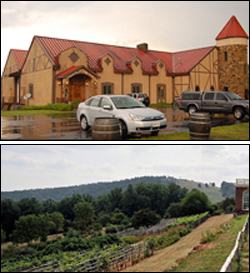 The Watson Pavilion also houses an authentic Japanese tearoom.Staunon, VA is home to the well-known American Shakespeare Center's Blackfriars Playhouse, an internationally acclaimed theater where the Bard's works are performed under their original staging conditions. Just a short forty-five minute drive south on Interstate 81, Roanoke is home to the newly constructed Taubman Museum of Art, which offers over 16,000 square feet of gallery space, as well as theO. Winston Link Museum celebrating the life and work of this noted photographer. 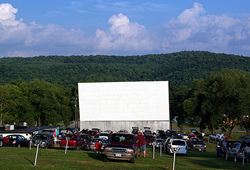 One of the last of America's drive-ins, Hull's Drive-In is located just north of downtown Lexington and regularly screens double-features of popular, recently released films, during the spring, summer and early fall. For the law student on a budget or the moviegoer tired of $10 tubs of popcorn, the concession stand is not to be missed. If you only have $3 and are wondering where you might be able to get a hamburger, two packages of peanut M&Ms, a drink and popcorn, we just might know a place. Lexington is a history lover's paradise. 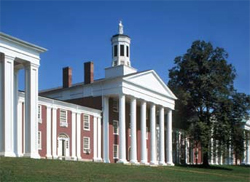 In addition to the points of Civil War interest in the area (including a host of battlefields throughout the Shenandoah Valley), there is also the Lee Chapel and Museum, the Stonewall Jackson house, and the George Marshall Museum on the campus of the Virginia Military Institute (General George Marshall of "Marshall Plan" fame is a VMI alumnus). You can even take a ghost tour of downtown Lexington during the warmer months.Within a short drive north of Lexington, there is Cyrus McCormick's farm, Walnut Grove, where one can find a working farm run by Virginia Tech and a museum dedicated to the man who invented the reaper. On your way there, you can stop by the Sam Houston Wayside and view a 38,000 slab of pink granite dedicated to Wayside, a Lexington-born statesman, politician and soldier.Roanoke is home to the Booker T. Washington National Monument, and the national D-Day Memorial can be found in Bedford, Virginia (about a one and half hour scenic drive from Lexington).And for Jefferson enthusiasts, there is Monticello in Charlottesville, as well as Thomas Jefferson's second home, Poplar Forest (it looks a bit like a smaller version of Monticello) near Lynchburg in Bedford County. 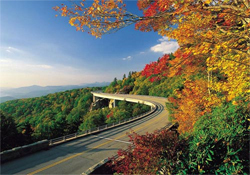 Lexington is situated a short fifteen minute drive from the Blue Ridge Parkway; outdoor activities in the area abound. Whether they're sitting by the river at Goshen, swimming at Panther Falls, cycling on one of Rockbridge County's scenic by-ways, hiking House Mountain, running on one of Lexington's many trails, golfing at one of the area's two golf courses, skiing at one of the four nearby resorts or simply working out at the University Fitness Center, our law students are an active group.And for those considering a hobby during their time in law school, might we suggest spelunking. There are a number of caves throughout the area, many of which (Endless Caverns, Luray Caverns and Natural Bridge Caverns) are popular tourist destinations.W&L Law's unique location affords students the opportunity to experience a variety of activities, outdoor and otherwise, they may find a very hard time doing in the cities in which they aspire to live and practice. You can't spell "Intramural" without "W" and "L"
Okay, so that's not exactly right, but the spirit of the sentiment is certainly true. While our law school may not have a competitive academic culture, our athletic contests certainly put that reputation to the test.Whether you play or simply spectate, intramurals are a large part of life on our campus. And even if you're not a great athlete, don't worry. It's law school. If being athletic were wrong, there are a great many people in this building who would be right. Very right. In fact, painfully right.Students play a variety of sports throughout the year - football in the fall, floor hockey and basketball in the winter and softball (the annual Dean's Cup softball tournament is a popular campus event) in the spring. These games are a great way to get to know your classmates and a great outlet during law school. Visitors to our campus in the fall are likely to find most of the student body on the law school lawn watching the glory, the majesty the passion that is the Law School Football League. Let's just say it's a good thing these people will have a law degree to fall back on. But in the sage and cautious words of Levar Burton, don't take our word for it. 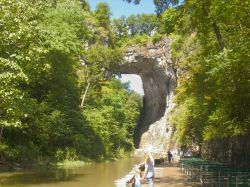 A short twelve-mile drive from Lexington, Natural Bridge stands as one of the area's most noted natural wonders. According to Frommers: Thomas Jefferson called this hugely impressive limestone formation 'the most sublime of nature's works . . . so beautiful an arch, so elevated, so light and springing, as it were, up to heaven.' The bridge was part of a 157-acre estate Jefferson acquired in 1774 from King George III. In the early 1750s, it was included in the survey of western Virginia carried out by George Washington, who carved his initials into the face of the sheer stone wall and beside Cedar Creek at the base of the gorge. This geological oddity dramatically rises 215 feet above the creek; its span is 90 feet long and spreads at its widest to 150 feet. The Monacan Indian tribes worshiped it as "the bridge of God." Today, it is also the bridge of man, as U.S. 11 passes over it. Who needs Wiltshire County, England, cramped plane seats, bad food and international jet travel? You can visit the really old world (think "Bronze Age") without ever leaving the new. Imagine a simpler time when tools were cast of bronze, Druids called the shots and giants roamed the earth. And now imagine southwest Virginia. Natural Bridge is also home to the Shenandoah's Valley's answer to Stonehenge: Foamhenge. Fashioned entirely from foam (yes, foam), and not to be confused with "Fridgehenge," "Twinkiehenge", "Bavarian Strawhenge" or "Phonehenge," Foamhenge is local artist Mark Cline's re-creation of the noted and mystery-shrouded timepiece/astronomical observatory/religious site/burial ground/alien monument. According to the artist:"Foamhenge 'appeared' on April Fool's Day 2004 after being assembled in place the day before on the property of Natural Bridge and yes it's all foam. It's popularity has exceeded my expectations having appeared on MSNBC, Fox, Discovery Channel and TBS. It's also been in National Geographic for Kids, Washington Post, USA Today, international magazines, and in several books, and on the cover of 'Strange But True VA.'"That's right "international magazines." However, those wishing to set their calendars by the structure should exercise due caution. According to Cline, "I've been present during the Summer Solstice and the sunrise there is only about 5 feet off. Don't worry I figure it should work itself out in about 4000 years."